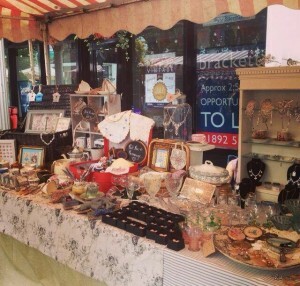 It was a busy weekend, at the Pantiles vintage fair. 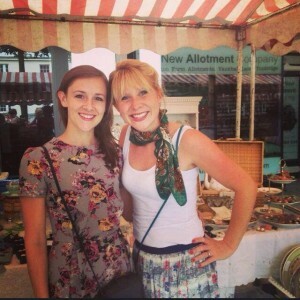 I shared a stall with the lovely Jemma from From the Folly. It was a great event with a buzzing atmosphere. 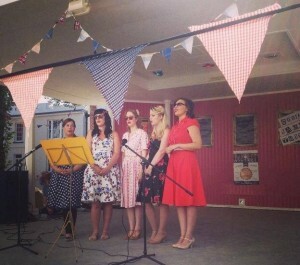 The Bombshells performing on the Bandstand. There was music all weekend, and a huge variety of stalls with some amazing scrumptious food to keep everyone happy. The weekend was showered with sunshine making for a cheerful crowd. On our stall we sold quite an array of pieces from handmade necklaces to teatime frames. Our vintage children’s books brought smiles to everyones faces, they clearly brought back some happy memories for people. One lady bought a pop up book of Three Little Pigs for her grown up son as it was his favourite story as a little boy … Cute! All in all it was a successful weekend with my most popular items being my sixpence and farthing cufflinks. I think it is the fact they make the perfect gift for the man who has everything. 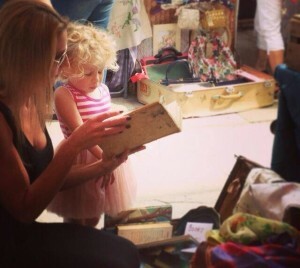 A mother and daughter looking through the collection of children’s books. Jemma and I enjoying the weekend.